5 things you can do right now to make planning your wedding easier. 1. Bask! You don't get engaged every day - before beginning the project of planning the biggest celebration of your lives, give yourselves some time to just BE engaged. No planning, no deadlines, no budgets, just you & your beloved. 2. Count. After you've had a chance to enjoy your new status, put together your guest list. Most couples do this with some input from their parents, though the ettiquete on who makes the list and who doesn't is different for each couple. If it's starting to get out of control, group people into categories: immediate family, distant relatives, professional friends, etc...then prioritize those categories. Put together your dream list first, work on cutting it down later if you have to. 3. Imagine. Carve out some quiet time together to talk about your ideas and dreams. Beyond the way your wedding will look, think and talk about how you want it to feel. What will your guests see, touch and even smell? Will the environment be upscale and elegant? Playful and rustic? Edgy and rough around the edges? Write it down. Refine it until it's one paragraph. Viola! This is the mission statement for your wedding that you can refer to whenever you are at a crossroads in the planning. With your guest list in hand and this, you've made your wedding blueprint! 4. Budget. You've already sketched out your dream, now it's time to see how the dollars and cents relate. If appropriate, gently ask your parents or grandparents if they will participate and what they can comfortably commit. Remember that those who pay may want input. Be comfortable with whatever you decide to do. Keep in mind birthdays and holidays from now until your wedding are great opportunities to ask for wedding related items: Your sister might want to gift you with a check towards your bridal bouquet, or maybe your step-mom might want to purchase the favors you've had your eye on. You may need to refine either your guest list or your mission statement to match the numbers, but doing so early will avoid overstretching yourselves financially or becoming disappointed late in the game. 5. Research. 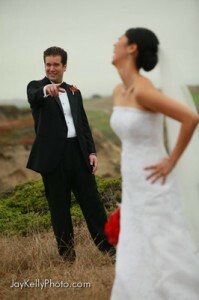 If you haven't already, investigate hiring a wedding planner. Now of course, I'm a bit biased, but as a former DIY bride who went without, I've experienced both sides of the coin. Certainly you can have a wonderful wedding without a planner, but depending on how much responsibility you want to pass off to a planner, you'd be surprised about how affordable we really are in the grand scheme of things. Many planners also offer hourly consulting, which is great for those projects that seem especially daunting to you. (For example, I’ve been hired to review timelines / contracts, create budgets and identify venues /vendors, just to name a few…) I'm always amazed with couples who invest thousands into flowers and decor, additional thousands on photography and videography, yet don't think that having a seasoned and experienced wedding planner who can be an unbiased and professional project manager is a good investment. After all, your photographer will be taking pictures of you all day and if the look on your face says: "I'm worried that my centerpieces haven't arrived, I don't know where my maid of honor is and I haven't eaten all day!" then those pictures will show it. My photographer buddies agree: Emotion is the one thing you can't photoshop into or out of a picture. Do chime in: What has saved you time and stress planning your wedding? You rock! I only wish I had you here in Boston for my wedding! So proud of you! If you or your clients ever need any makeup advice, give me a shout. I may live across the country, but I can always offer tips on how to find the perfect makeup artist for the day, what the going rate is, or even what products to use to keep your makeup looking fresh all night long! Hug! Anna: Thanks for the suggestion…and I would love to plan a Swedish wedding!